An Italian charity ship carrying 49 migrants rescued at sea said on Tuesday Rome had refused to let it dock in the latest stand-off between the government and private aid vessels. Interior Minister Matteo Salvini had on Monday reiterated that Italy's ports were "closed" to new migrant arrivals, insisting his hardline approach to asylum seekers since last summer has effectively stopped departures from crisis-hit Libya. 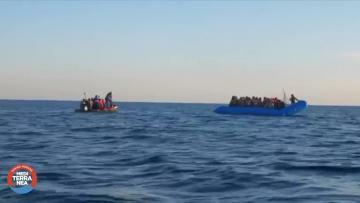 He said the Italian vessel Mare Jonio had not carried out a rescue operation but instead "aided illegal immigration". "We have people on board who are sick, I have to take them to a place of safety and there are two-metre high waves. I'm not turning off the engine," Captain Pietro Marrone told the authorities, according to the Avvenire daily. On Tuesday he said the ministry was creating a commission of "experts and police" to ensure his directive - which lays down rules about rescues at sea -- was enacted. "It takes no account of the dramatic reality," council's director Mario Morcone said in a statement. As Italy's financial police boarded the Mare Jonio for an inspection, Deputy Prime Minister Luigi Di Maio confirmed the vessel had refused an order to switch off its engine. He said accused the ship's crew of "disobeying an order from the Libyan coast guard by taking on board the migrants". Since Italy's populist government came to power last year and began a crackdown on rescue vessels, "we have seen an exponential increase in the number of deaths compared to the number of migrants landing," the council said. Some 152 people have died in 2019 so far, while 471 have reached land in the central Mediterranean, meaning one out of every three migrants trying to make the perilous crossing from North Africa are dying in the attempt.